Is it a pot or is it a container? Who knows? So, what is the difference between a pot and a container? Well, since you asked, mostly it is determined by size. Pots are usually small and can be easily moved. Containers on the other hand are much larger, having a capacity of more than 3 gallons of soil or 12” diameter and larger in size. They can be moved,but with much more effort and some are so heavy that is it better to leave them in place year round. Containers come in many shapes, materials and sizes and include planters, window boxes, very large pots, urns, bowls, planting boxes, jardinières, and planting troughs. Landscape Architects use containers in many different ways. Much in the same way that furniture can set the style in a room a Landscape Architect can use containers can set the style in the garden. Containers can be used to create a colorful accent at a doorway, to create an edge to a garden or path, as a design element for a garden space, an enclosing element in the garden or at the edge of a terrace, or as a focal point in the garden. Containers are mostly thought of as a garden element but they can best used in much more practical ways. On roof decks and plazas over structures planters provide enough soil depth to grows trees, creating shade and attractive gardens in urban settings. Also, after 9/11 security in public spaces and at corporate facilities became a very serious concern. The design problem was how to provide a security barrier quickly and attractively. In many public parks and plazas, landscape architects used large concrete planters to create security barriers and to control traffic flow. Addressing the need for security without sacrificing the aesthetic or design of the spaces they were protecting. Various options are available for containers. They can be made of different materials including metal, concrete, glazed ceramic, cast stone, terracotta, fiberglass, plastic, or stone. Of course it is vital that the container fits within its surroundings and matches the style of the garden. Most planters come in a variety of color and have options for texture. These should be carefully considered when selecting them to make sure it is appropriate for the space. The container should blend harmoniously with the other materials nearby on the project. 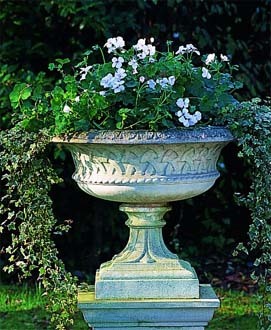 The planter should also be sized appropriately to accommodate the plantings that are intended to go into it. Most annuals need 12-18” of soil depth to grow and look good. If you want to grow a tree in a planter you will need 24-42” of soil and 6-8’ diameter minimum. Careful attention should be paid to the soil mix, drainage requirements and watering requirements for the planters. 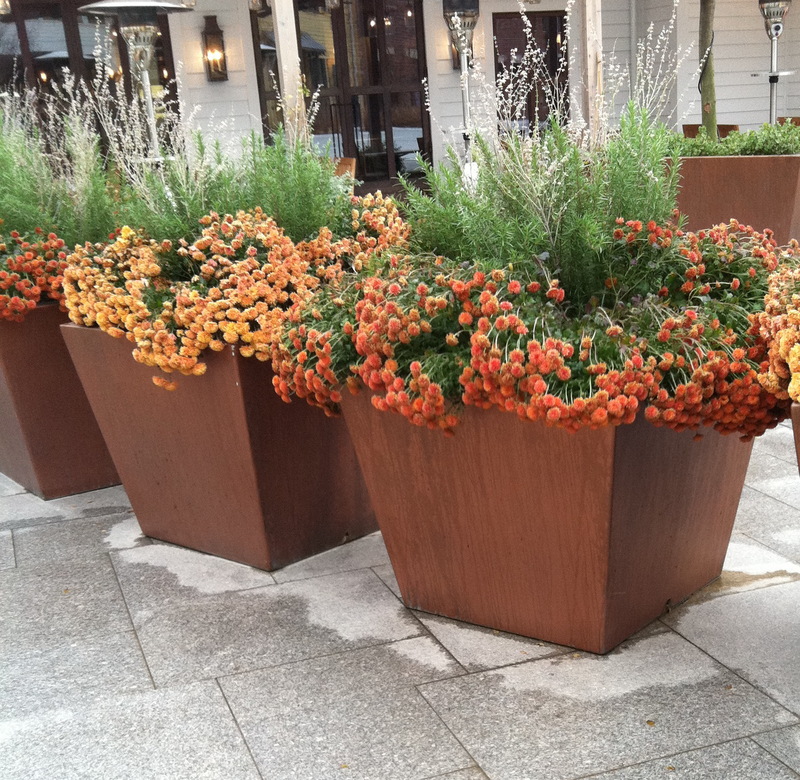 Many large planters in commercial settings have irrigation systems built into them. Having the right soil mix for your application is important to success of the plantings. Consider adding a soil moisture retaining polymer to the soil to prevent it from drying out. Rooftop and over structure applications will require lightweight soil mixes keep the weight down. 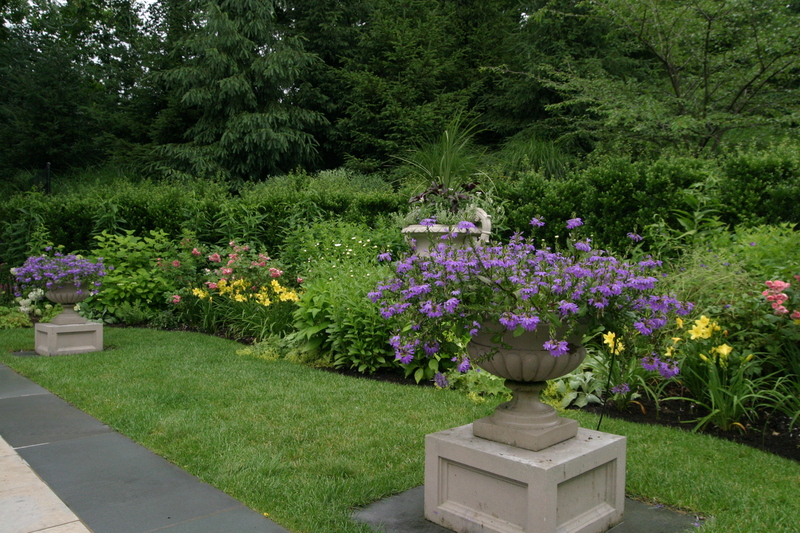 Planters can be used as part of a formal perennial bed as an accent or repeated to create rythm. Containers can be arranged in groupings of similar color, size or material or as complimentary groupings of diverse assortment to make a statement. 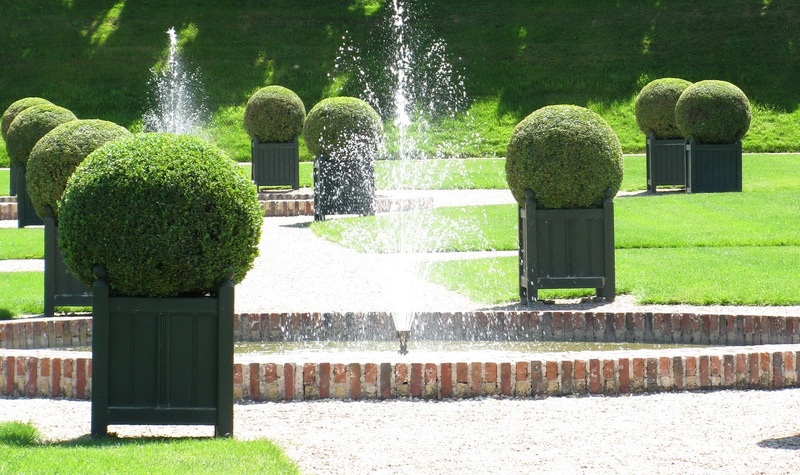 Additionally containers are can be used as a formal design element in garden or landscape, as a sculptural element, for traffic control, for plantings on roof tops or on terraces were in-ground plantings are not possible. Other uses for containers are to plant non-hardy fruit trees (like oranges, lemons, limes, etc.) that are summered outdoors and then are carried inside for the winter months in areas of the country where the trees are not winter hardy and also for larger landscape plants like specimen trees, fruit trees, evergreen shrubs or flowering shrubs that are looking for permanent homes above ground. You could also make a container out of a found object or cast-off like an old metal bucket, wheel barrow or bathtub, anything left up to your imagination could be used. These sort of containers can create a whimsical tone in the garden. Not sure where to begin. Not sure how to use containers in your garden or what’s the right container for your project. 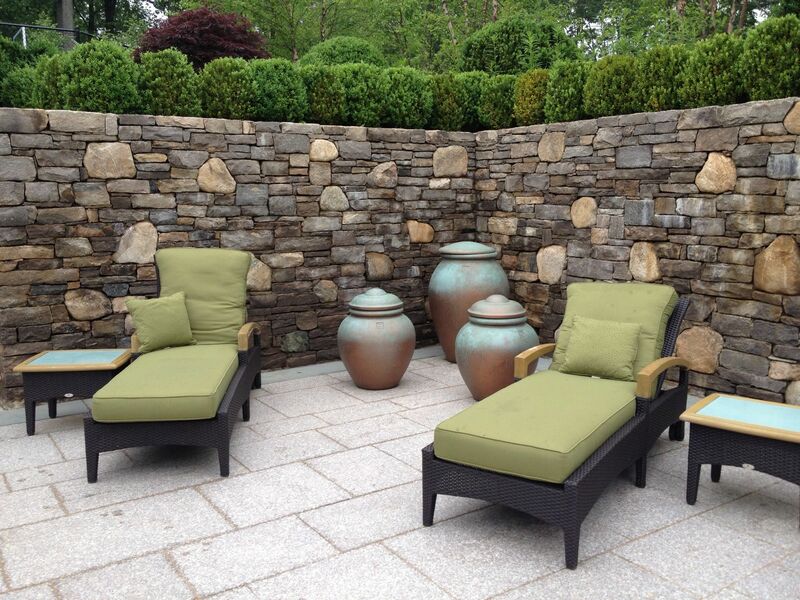 We can help you pick the perfect containers for your space, call Rock Spring Design Group, LLC 203•268•6979 or email us at info@rockspringdesign.com today for a free one hour consultation to start planning your upcoming landscape project www.rockspringdesign.com. This entry was posted in Blog and tagged connecticut gardens, containers, garden design, garden planning, Gardening, Landscape, Landscape Architecture, Landscape Design, outdoor furnishings, outdoor garden rooms, planters, planting, Planting design, pots, roof top gardens, Site Design, urns. Bookmark the permalink.